The end of the initial, six-episode season of THE WALKING DEAD was time to look back at the beginning of the zombie plague. The teaser segment revealed how Rick came to be left all alone in a hospital overrun with walking dead: Shane thought Rick had died because he couldn’t hear his heart beating during the army siege of the hospital. But on his way out, Shane propped a gurney against Rick’s door… and that kept the dim-witted, shambling walkers out of his room. Back in the present day, Dr. Jenner (Noah Baumbach) left Rick’s (Andrew Lincoln) band of survivors inside the remains of the Centers for Disease Control and Prevention, and treated them to food, wine and hot water. Just about everyone got drunk – and good thing, too, because the next day, Jenner revealed that CDC was running out of power, and when that happened, the entire facility would be sterilized. I really enjoyed this series as a whole; all six episodes were taut and exciting, and TS-19 kept up that tradition, however the ending was somewhat vaguely unsatisfying. Having everyone high-tail it outta CDC just ahead of the explosion and take off down the highway like bats out of hell felt rushed. Maybe it was the caravan aspect; we saw our friends pile into the vehicles, but didn’t see them inside, so I felt like I didn’t get a chance to say goodbye before the season ended. But I was satisfied with the teases of information about the zombie plague. The show wisely did not nail down a definitive explanation for the walkers. Viewers do not know the precise mechanism of the microscopic whatsis that turns people into walkers, nor do we know the source. Jenner shared what he knew about the walker infestation by sharing brain scans of TS-19: “Test Subject 19.” The scan observed a person who was bitten, as a black cloud of…something, filled the brain. After being bitten, the brain shuts down, and then the internal organs fail. Anywhere from 3 minutes to 8 hours later, the brain is restarted, but only the basic brain stem – just enough to get the walkers up and running, leaving the former person “a shell, driven by mindless instinct.” Of course T-19 was Jenner’s wife (did anyone not guess that? ); Jenner knew her resurrection came 2 hours, 1 minute and 3 seconds after death. (But who’s counting?) Jenner admitted he had no idea what causes the black cloud in the brain after a walker bite. It could be bacterial, viral, parasitic, microbial, fungal…nobody knows. And there would be less than nothing left after the “facility-wide decontamination” got through setting the very air on fire. I liked seeing the grief-stricken reactions of the group to word that “Vi,” the computer that operated the building would soon kill everyone. “This is what takes us down,” Jenner said. “This is our extinction event.” Did it strike anyone else as very odd that CDC’s self-destruct would be designed to completely take out the entire building? What if some microscopic specimens survived the fire? They would be free to float out into the atmosphere at large, because the building was wiped out. Talk about breaking quarantine! Jenner allowed our friends to flee the lockdown – with the exception of Jacqui, who figured the world was over and she was as good as dead anyway. Andrea wanted to stay behind with Jenner and Jacqui, but Dale (Jeffrey DeMunn) convinced her that if she was staying, he was staying, in order to be with her. 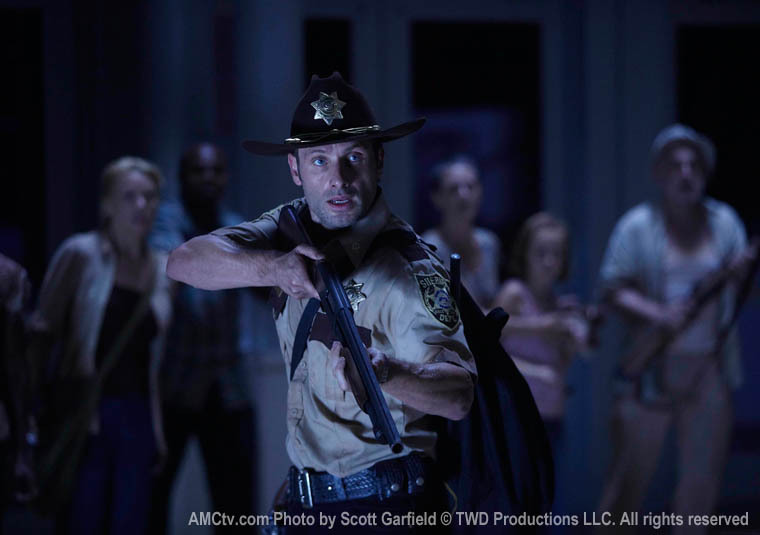 This entry was posted in TV and tagged season finale, The Walking Dead, TS-19, Walkers, zombies. Bookmark the permalink.